You will be doing similar exercises as Level 1 but they will be more complex, i.e. greater distances. Walk to Heel ~ you have learnt the basics, now you will progress to heel work off the lead, again keeping it relaxed using food or toys if needed. Sit/Stay ~ again you have the basics, you will now build up to walking a full circle around him and then walking several paces from him ~ building up to a one minutes stay. Recall ~ building on what you have already learnt, you should be aiming to recall your dog from anywhere and under any reasonable circumstances. Once you know he will retrieve and bring the dummy to hand you can start making him steady to the fall of the dummy and introduce the "Mark" command, hold him to make him steady and tell him "Mark" as the dummy hits the ground, wait a few seconds before telling him "On and Fetch", as he goes to pick the dummy tell him "Hi-Lost" or simply "There". Once he has picked the dummy up encourage him back to you. 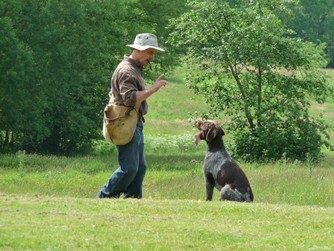 Steadiness ~ If the dog is steady on his stays it will help with steadiness later on. This incorporates steadiness to shot (starting pistol) and the fall of a dummy. Dummy ~ this is usually done with the dog in a stay position, the trainer will probably have you all sitting in a group and throw dummies randomly around, you keep the dog in the sit and tell him leave, the trainer/handler will then pick up the dummies and repeat the exercise. Obstacles ~ The dog should be able to jump any obstacle as required. Start with something low and use a word (jump, up, over) have the dog on a lead so you can control what he does and encourage if needed. It is recommended that the dog is not encouraged to jump anything too high until he is at least 15 months, due to the fact that his body is still developing. Start with shallow water and encourage him to go in, and then encourage him to swim. (sometimes it helps if there are other dogs around that are happy to swim, just by playing in the water the dog may end up swimming without realising it). Your aim is for the dog to enter water safely and freely and bring the retrieve back to you. FETCH ~ once the dog has marked the fall of the dummy and you want to send him use this command. TOP TIPs ~ every exercise requires building on, and a firm base will give better results.